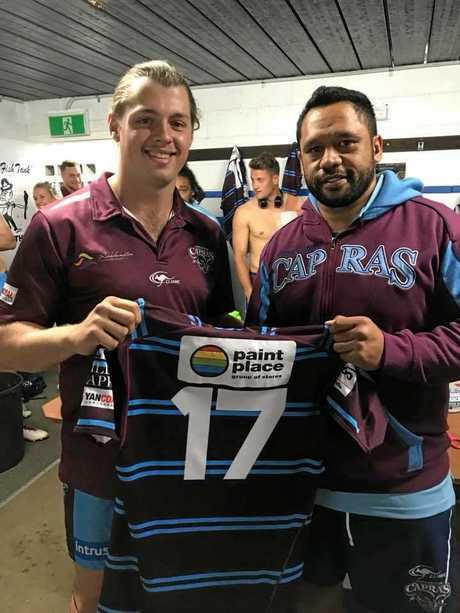 RUGBY LEAGUE: It was a proud moment for Miriam Vale product Connor McGarry when he made his Capras debut against the Sunshine Coast Falcons on Saturday night. McGarry came on for his first Intrust Super Cup appearance in the 59th minute of the Capras' 26-18 win at Marley Brown Oval, coming on in jersey 17 as a replacement for prop Brad Lupi. Capras coach Kim Williams was full of praise for McGarry, who played during a tense final quarter of the match with the result still up in the air. "I thought he handled himself very well. We put him on in the last 20 minutes when the game was on the line and if I didn't have faith in him I wouldn't have put him out there," Williams said. "He's done a great job and he's one (win) from one so he might get another start next week." Williams said McGarry was one of a handful of under-20s players who have progressed through the Capras' ranks during the latter half of the season. "We've had a group of under-20s training with us close to two months and it was always going to be one of those four or five guys who got a start," he said. "It's really exciting for me as an outgoing coach and for the club to see that pathway we've set up have its first success. "They'll be a bit of a procession now of U20s over the next 12 months graduating into our first grade squad. "This is the first of a long line of quality young men coming through this club."